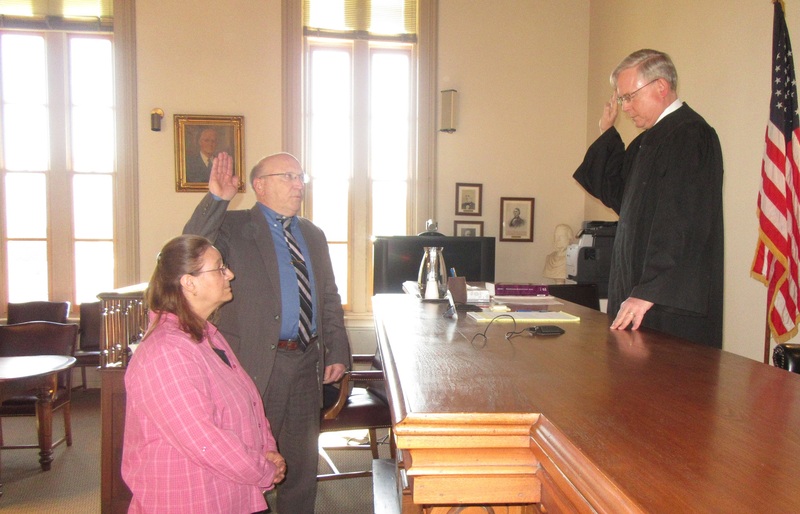 With his wife Janie at his side, Mike Stabinsky of Windham Townships takes the oath of office as an interim county commissioner from president judge Russell Shurtleff (above, right). County employees filed into Courtroom #1 at the Wyoming County Courthouse on Monday afternoon for the swearing in of Michael Stabinsky as county commissioner. Stabinsky was selected by the Wyoming County Democratic Committee to serve out the term of long-time commissioner Ron Williams, who passed away in December. Stabinsky’s nomination was subsequently approved by president Judge Russell Shurtleff, who conducted the brief ceremony. 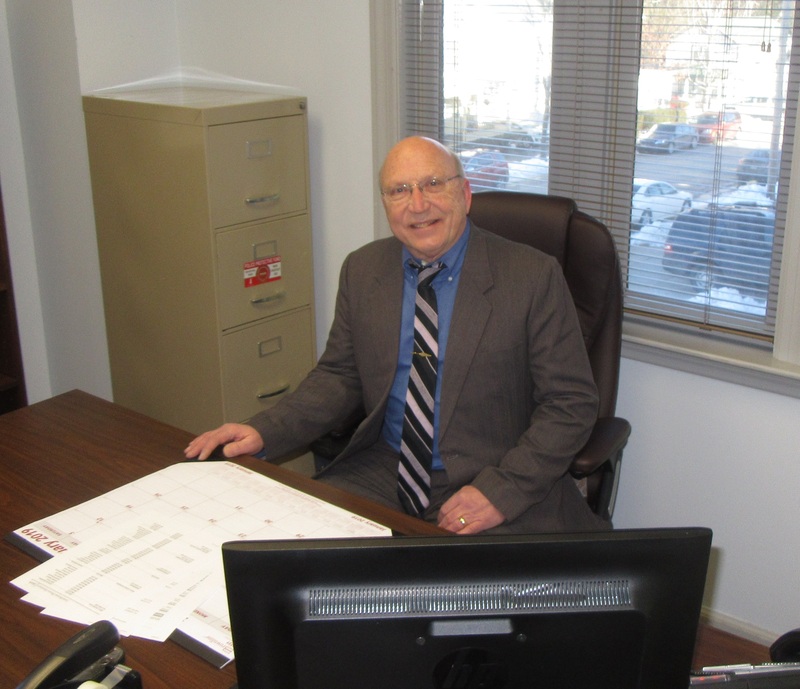 Stabinsky is a state trooper from 1982 to 2007 and served for about nine years as a Windham Township supervisor. He is also the vice chairman of the Wyoming County Democratic Committee (WCDC), which submitted his name to the judge on Friday. Shurtleff phoned Stabinsky on Saturday and made arrangements for the ceremony. In his letter to Wyoming County residents, Shurtleff explained, “Mr. Stabinsky has agreed to work full time in the position and will not seek election to that office,” the latter being a condition that the judge had requested when soliciting a replacement for Williams. Stabinsky confirmed on Monday that he will not campaign for the seat and stepped up simply to help the county. He admits that he is not completely familiar with all of the responsibilities. He has ideas that he would like to address with his fellow commissioners but wants to learn first what authority commissioners have over different situations. “I feel that our county is on the right track and doing as well or better than our neighboring counties,” he stated. Stabinsky had dropped off a letter of resignation at the Windham Township office on his way to the courthouse. In an informal meeting in the commissioners office after the ceremony, commissioner Tom Henry assured Stabinsky that he and commissioner Judy Mead would steer him to all the resources that will help him perform his duties, including the County Commissioners Association of Pennsylvania, which will conduct its spring conference March 24 to 26. 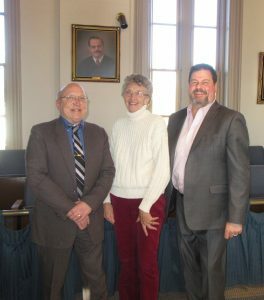 County Commissioners Judy Mead (center) and Tom Henry (right) welcome Mike Stabinsky to their ranks after he is sworn in. Stabinsky at his new desk.